Phil is the co-founder and director of The Gold & Silver Club, an international commodities trading, research and advisory group specializing in the precious metals, energies and agricultural markets. Phil heads up the group’s commodities training business working with private retail and institutional clients across the world. Phil has over 10 years commodities trading and portfolio management experience with in-depth knowledge of the precious metals, energies and agricultural markets. Phil’s opinions on the markets are routinely sought by major financial television channels and he regulars speaks at international trading summits, conferences and workshops. The Gold & Silver Club is an international commodities trading, research and advisory group specializing in the precious metals, energies and agricultural markets. 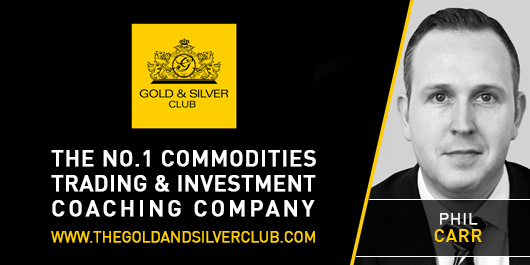 The Gold & Silver Club is recognized as a leading 'go to' firm on commodities. As internationally respected commodities experts, the group’s analysis and opinions on the markets are routinely sought by major financial television channels and publications including Bloomberg, Reuters, CNN, Global Banking & Finance Review and The Wall Street Journal to name a few. We value your privacy. We never share your email address with anyone. For further information on The Gold & Silver Club, please visit: Thegoldandsilverclub.com. Check out the following recordings of Phil's most recent webinar on our new YouTube channel. Do you want to become a Binary.com contributor/webinar speaker? We provide business partnership services like API, White Label etc.